The raccoon is a medium-sized mammal native to North America. It is the largest of the procyonid family, having a body length of 40 to 70 cm and a body weight of 3.5 to 9 kg. Its grayish coat mostly consists of dense underfur which insulates against cold weather. The raccoons have two most distinctive features - their extremely dexterous front paws and their facial mask are themes in the mythology of several Native American tribes. Raccoons are noted for their intelligence. Studies show that they can remember the solution to tasks for up to three years. The diet of the omnivorous raccoon consists of about 40% invertebrates, 33% plant foods and 27% vertebrates. Studies in the 1990s by the ethologists Stanley D. Gehrt and Ulf Hohmann indicated raccoons engage in gender-specific social behaviors and are not typically solitary. 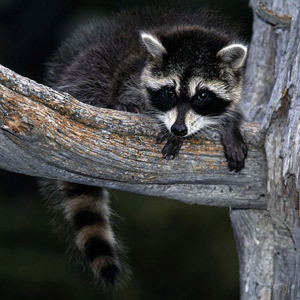 Raccoons are common throughout North America from Canada to Panama. The increasing number of raccoons in urban areas has resulted in diverse reactions in humans, ranging from outrage at their presence to deliberate feeding. Relocating or killing raccoons without a permit is forbidden in many urban areas on grounds of animal welfare. Raccoons become a serious problem for homeowners when they raid yards or homes and they may find shelter in chimneys, basements, attics, and spaces between walls. They can be heard during the night or early morning hours scratching around and they often damage drywall and insulation which could be a sign of their presence. To avoid problems with raccoons you can find animal control professionals who can safely trap and remove raccoons without using poisons.